As I was doing research on my new tyvek bivy, I stumbled across MoonbowGear.com. These guys have developed a super light, super convenient backpack for short or long trips. 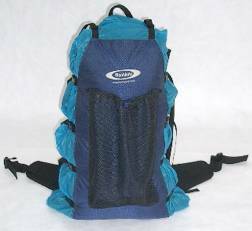 The pack essentially takes advantage of the gear you are already carrying. 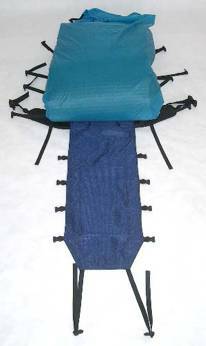 By doing this you can eleminate unnecessary weight and save time packing up camp. See the pack below or go to MoonbowGear.com. 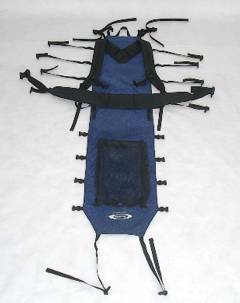 is a harness/compression system that acts like a pack. It is a piece of material that is roughly the size of a ground pad, with compression straps, and harness (shoulder pads, hip belt) attached. these can be folded and the gearskin clipped around, with food and other items placed inside the fold. Weighs 1 to 1.5 lb. Adjusts from 2500-6500 cu. in. Custom fit shoulder straps and waist belt. Made from siliconized rip stop or packcloth...your choice. 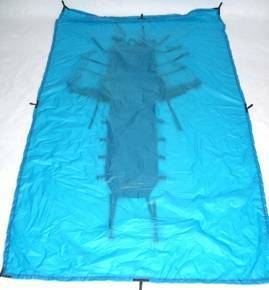 Now add your ground sheet / tarp / bivy / tent - whatever shelter you are using. In this example, we'll demonstrate a ground sheet. Place your ground pad on top (or in shelter). Fold the ground sheet over the sleeping bag and place your food on top. Bring beavertail up and clip two top buckles. Clip side buckles loosely and evenly at first and position gear inside properly before the final cinch. Gear can now be accessed from the top. You have successfully assembled your custom Gearskin Backpack. 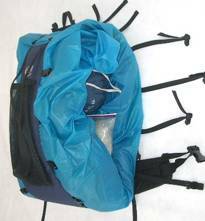 Use a packliner for additional protection of your sleeping bag. 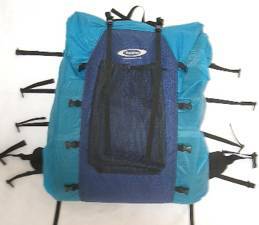 Pack covers, VB liners, Waterproof stuff sacks. You name it! Prices start at $180.00. Contact us for a quote.